Good Friday morning! I started writing this post three days ago … don’t know what happened, but I lost everything! It’s OK because I rewrote it over and over again in my head … several times. I would ask myself should I share or just post the recipe? I decided to do both. I finally figured out that I’m in a slump and need to SNAP OUT OF IT! I’m not in a rut … my rut or routine has been changed … I think that’s my problem. Several changes have taken place around here, some good and some not so good. My hubby recently lost his oldest brother, whom he would visit twice a week, after a long battle with Parkinson’s Disease. Our 14-year-old puppy, a.k.a. my hubby’s daughter and my pretty girl, had been ill for several months and we lost her Monday. On a good note … we are back in home improvement mode … we are slooooow home improvers … finally finishing a master bathroom that has been six years in the making (loooong story). We have had a nice time visiting with family from out-of-town that we don’t get to see often enough. We have a few short trips planned, including one to Laughlin, Nevada. Grease a 9″ x 13″ pan and a spatula with butter or cooking spray, set aside. In a large pot (6 quart) melt butter over low heat. Add marshmallows and stir until melted. Remove pan from heat, add Rice Krispies, stir until coated. Immediately pour 1/2 of mixture into prepared pan, sprinkle candy evenly, add remaining cereal mixture. Use prepared spatula to press into pan. Let cool and cut into bars. Good luck … I hope you pick a winning bar and hit the jackpot! Thank you for listening to my ramblings and I ♥ your comments! Having lived in CA and now TN I’ll take Cracker Barrel any day over In-n-Out. LOL I do hear transplanted west coast people lamenting we don’t have In-n-Out here though. Let’s hear it for Cracker Barrel!!! Yes I live in the south and whenever I take a trip it seems I want to stop at every cracker barrel I see just to see what is different in their little shop. Because every one is a little different! 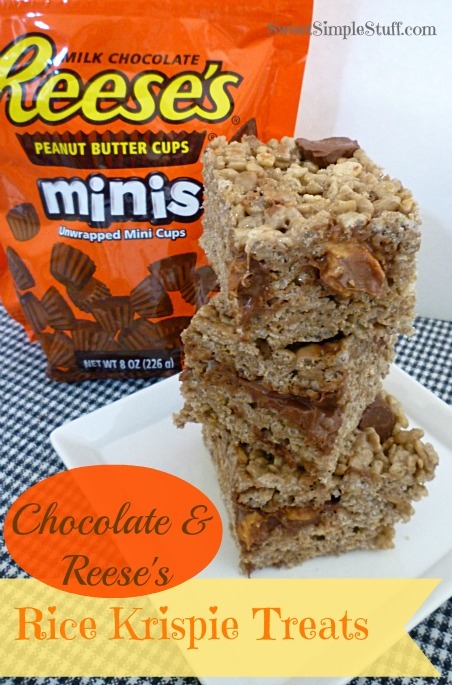 ha As for these Reese’s PB cup choc rice krispie treats sound yummy! 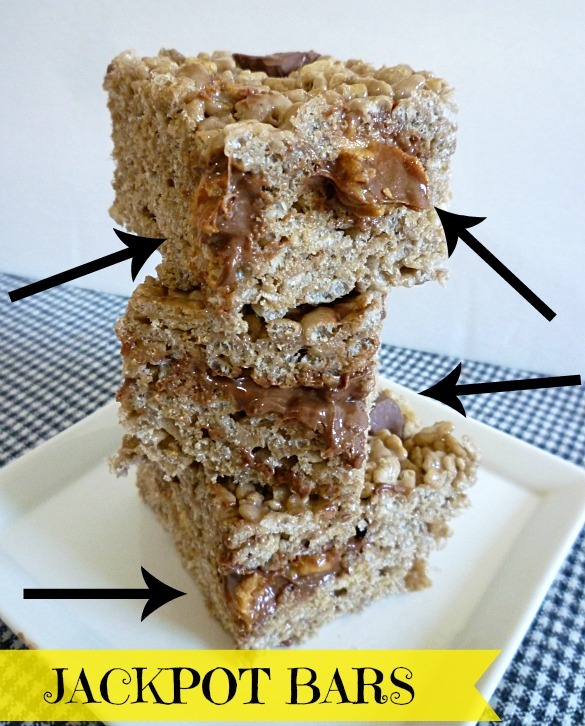 will definitely have to make them! Thanks! Sounds utterly delicious. Yes and I can’t wait to go to Cracker Barrel. Love their gravy and biscuits and fried apples. I totally get your desire to stop at Cracker Barrel. We are lucky enough to have one about 15 minutes from our house. I love shopping there and often stop just to shop for holidays stuff. Thank you 🙂 I would be in soooo much trouble if I lived that close to Cracker Barrel! Sorry to hear about your loss. Thoughts and prayers are with you. It has been so long since I have been to Cracker Barrel. Always loved shopping in their little store but after having a bad experience years ago eating @ CB we have quite going. Wishing you a wonderful and enjoyable weekend. Thank you Colleen 🙂 Here is my secret … DO NOT OPEN THE BAG OF PB MINIS UNTIL YOU ARE READY TO USE THEM … it works sometimes for me! So sorry to hear about your losses. My prayers are with you. Thank you Jennifer 😉 I remember that commercial … are we dating ourselves? oh life! it is one giant roller coaster isn’t it? and those dips are awful but keep holding on and it’ll go UP again. cracker barrel is one sure way to go up 🙂 and these krispies are another! so i’m sure your brother-in-law and your puppy are now running free and smiling down on all of you. cherish the happy memories.